A court has allowed him to run despite a constitutional ban and referendum result against such a move. Bolivia’s President Evo Morales has celebrated his 13 years in office amid controversy over whether he should be allowed to run again. 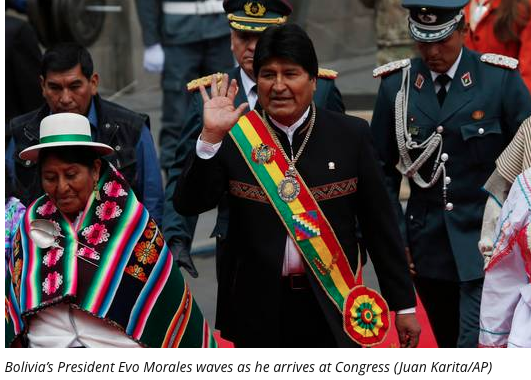 Last year, Bolivia’s top electoral court accepted Mr Morales’ candidacy for a fourth term despite a constitutional ban and referendum against such re-election. Elections for the next five-year presidential term are set for October. Mr Morales on Tuesday highlighted his government’s achievements, including having South America’s strongest economic growth. Mr Morales spoke during his annual speech to Congress. He took office in 2005 and was re-elected in 2009 and 2014. 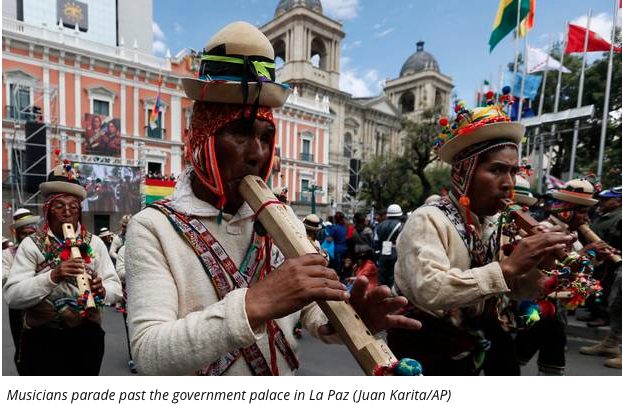 Bolivians rejected a constitutional amendment to allow more than two consecutive terms in a 2016 referendum. But Mr Morales’ party convinced the constitutional court to rule his candidacy was legal, saying term limits violate citizens’ human right to run for office. This entry was posted in Bolivia, Politics, Social Unrest and tagged corruption in public office, demagogue, democracy in peril, government failures, police and judicial corruption. Bookmark the permalink.